I’m a big fan of bars opened by Drake & Morgan. I instantly fell in love with the décor and cocktails on offer at The Refinery, and was dazzled by the food and cocktails at The Drift Bar, so when I was asked if I would like to try the brunch menu at The Fable Bar I immediately thought “this could look like a romantic gesture” and arranged to pop along to the bar with the other half on a lovely sunny Sunday (she cottoned on that it wasn’t a hopelessly romantic gesture very quickly!). 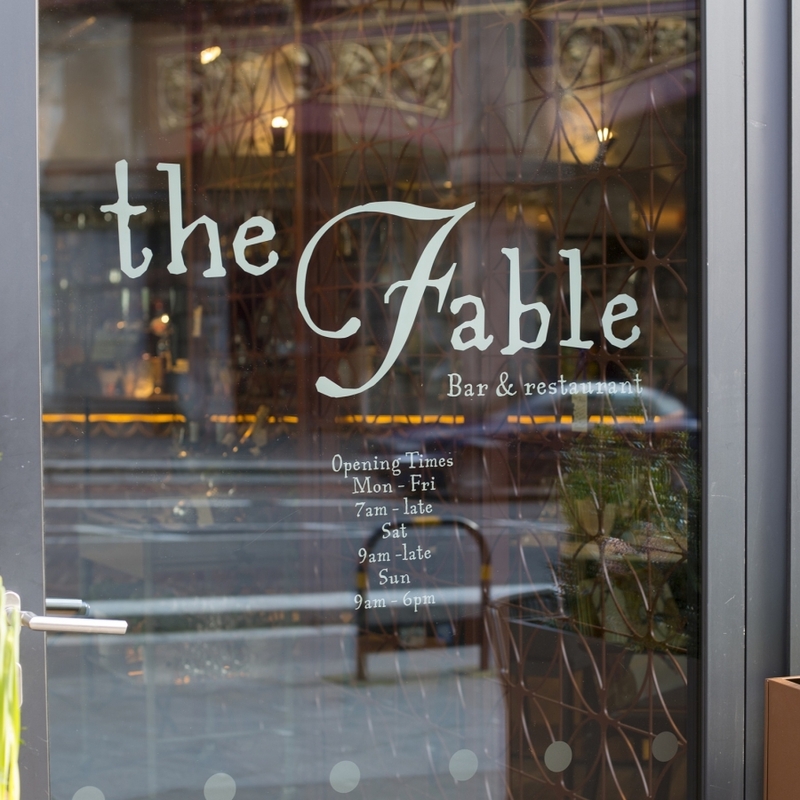 Based in Farringdon just on the outskirts of the city, The Fable bar sits over three floors and is situation right next to the stunning Holborn Viaduct. Every Drake & Morgan establishment has a theme, and at The Fable Bar it is literary - there are famous quotations everywhere you look, a cool booth made out of stacked books and on the second floor an enormous bookcase. This is what Drake & Morgan say about the bar…..
"Once upon a time in a land far, far away The Fable Bar was created for the Drake & Morgan collection. Inspired by the fantasy world of fairy tales, the fabulous fables of Aesop & influences from around the globe, it is a bar & restaurant out of the ordinary, where every detail tells a story. A veritable jewel box brimming with unexpected surprises, The Fable offers seasonal food & sensational cocktails alongside bespoke events, fascinating masterclasses & unique customised experiences. When we arrived the bar was quite quiet (something I like, so I can hear what people are saying) and the music was at just the right level - after being seated I opted to start with green tea before moving onto a cheeky cocktail, opting for an original Mojito while Rachel went with a passion fruit Mojito. Both were stunning (as I have come to expect from D&M), mine was packed with mint and it packed a punch, they certainly hadn’t been shy with the rum! Now that’s a way to start the day! The food menu is awesome and there really is something for everyone, but after taking a peek at the menu online before setting off I knew what I was going to be having, and I plumped for the salt and pepper calamari/squid for a starter and the roast beef for my main. The squid was crispy and well cooked - with a touch of lemon to season the rich batter this had me worried that I would be able to finish my main. The plate was rammed, and as a nice touch there were tentacles so like a child I could wave them in Rachel’s face while making strange noises. It’s the little things that amuse me! Rachel’s starter looked amazing - she went for a scotch egg with piccalilli. She said that the egg was perfectly cooked and perfectly runny and the piccalilli was spicy enough not to overpower and dominate the taste, but give enough kick that there was a gentle heat. There you go (ripped off directly from her thoughts on brunch). For her main she went with a Wagyu Burger served with a blue cheese dressing with a rich tomato chutney. The burger also came with a portion of Cowboy fries which are drizzled in honey, chilli and garlic. I didn‘t like the sound of these but only managed to get to try one before she demolished them. As my dish was served my first thoughts were “where’s the beef”, it looked like a bit of a tight fisted portion at first, but then all of the other components of the dish arrived and I immediately thought “oh, sh*t, how am I going to eat all of this”. The beef was actually just the right amount and cooked to perfection - mine was slightly rare and tender. It was easy to cut, not a hint of sinew and it just melted in the mouth. The vegetables were crunchy, the gravy lovely and rich. Everything had a full flavour and these blended with the honey coating on the carrots to create an absolute taste sensation. I have to confess, I couldn’t eat it all and even worse, I was so stuffed I couldn’t fit in one of the awesome sounding puddings. Instead I went for a pudding cocktail! Rachel went with a Tipsy Affogato with vanilla ice-cream, Amaretto and Kahula with a side helping of espresso while I had a Raspberry ripple which is a mixture of Johnny Walker Black, Drambuie and Honey Liquor was topped off with Raspberries and Cream. Holy Jesus! This starts off as a nice creamy number before boom - the Johnny Walker is almost hidden until the end, and as you work your way through you hit a bed of raspberries - it’s sweet, then strong, then sweet again, all topped off with rich cream. It is like a course in itself! The food and cocktails at The Fable Bar are out of this world - I have been back since and can’t get enough of those pudding cocktails. This is the perfect place to drop in and read a book over a pint, come for dinner in the evening or just for a bite to eat during the day. It’s clean, the staff are incredibly friendly and the dishes are reasonably priced while the meat is sourced from local butchers. The Fable Bar has everything. Omg this bar is amazing, I love the style and everything. I got so hungry now! OMG! I drive past this when I drive into London and always stare longingly into the windows! 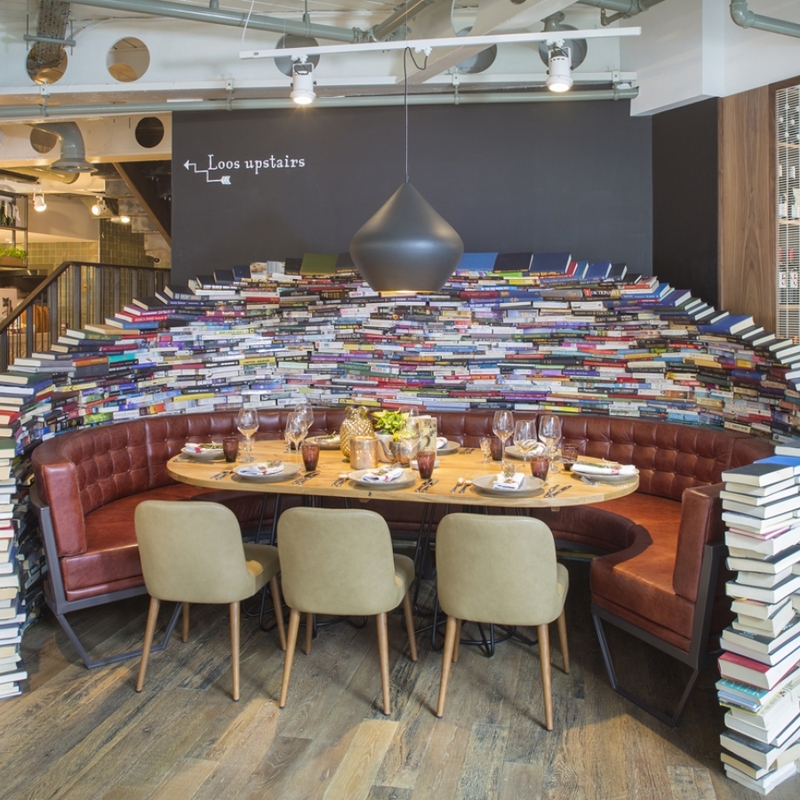 I will have to go, as a librarian the chance to have dinner in a booth surrounded by books is calling me! 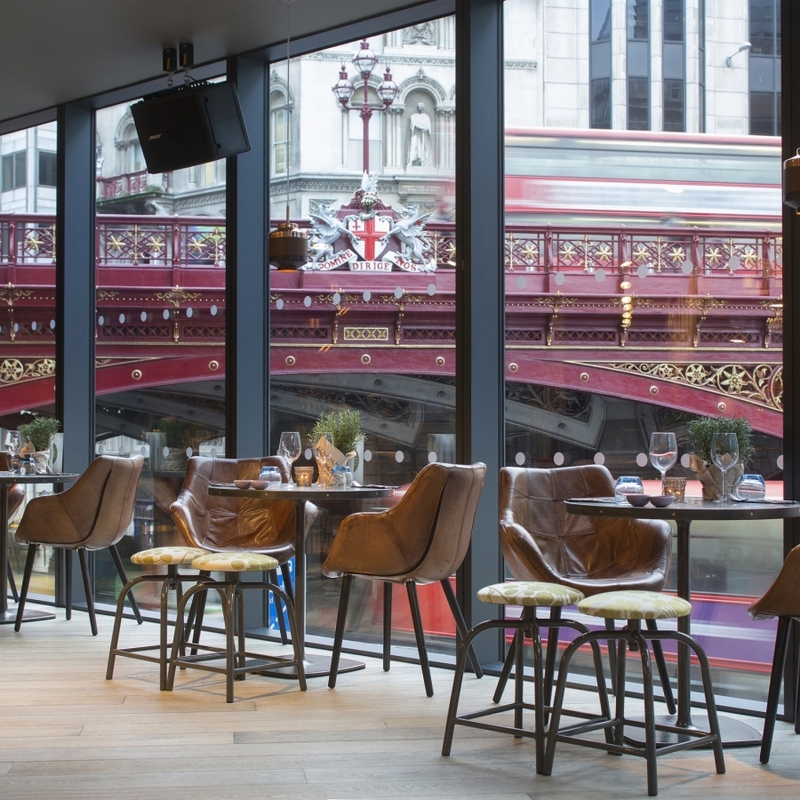 What a great looking bar - very trendy and the food and drink looks lush. I like places like this... Instagram worthy!!! loving the seating and book .. oh the wonder of such a place ! and the food and drinks look good as well. The booth made from books looks amazing and the food looks divine! That looks amazing!!!!! Not at all jealous! I love that seat with all the books around it - very much my sort of place. I love the concept of this place - the table surrounded by books looks fantastic. I love the Happenstance and the Refinery Bar too. Everything about them is brilliant. Usually it's the food photos that draw me in but as soon as I saw that book booth, I fell in love with the place!